Rapeseed Oil (76%), Pasteurised Free Range EGG and EGG Yolk (8.7%), Water, Spirit Vinegar, Salt, Sugar, Thickeners (Guar Gum, Xanthan Gum), Lemon Juice Concentrate, Flavourings, Antioxidant (Calcium Disodium EDTA), Paprika Extract. 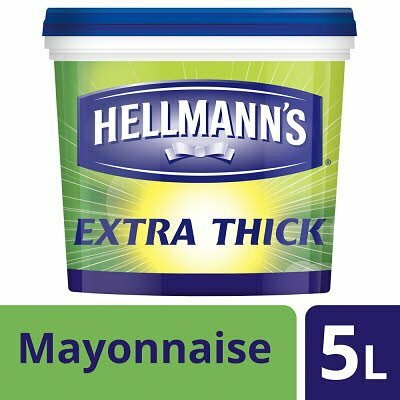 When refrigerated, HELLMANN'S Extra Thick Mayonnaise in salad preparations resists breakdown for up to 24 hours. Keeps a salad looking fresher for longer. It's also a good natural source of Omega 3.